There were lots of options but not one that seemed just right. I wanted the ornament to be a Christmas tree to go along with a cute Christmas counting book that has 2 Christmas trees. I thought that would be perfect … one tree for Mommy and one for Daddy. Then I saw these lovely colorful craft-stick Christmas tree ornaments ( “Happiest Trees EVER”) at Trisha Brink Design. 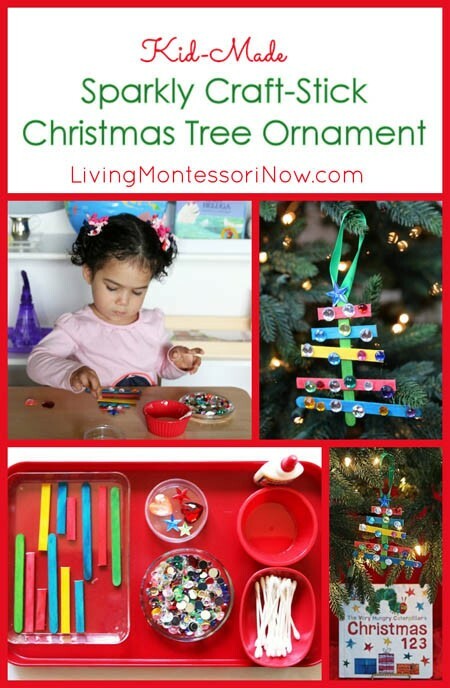 I couldn’t help but think that a Montessori-inspired learning activity along with a Christmas ornament would work well for older toddlers as well as preschoolers. Even older children could make a more polished version. 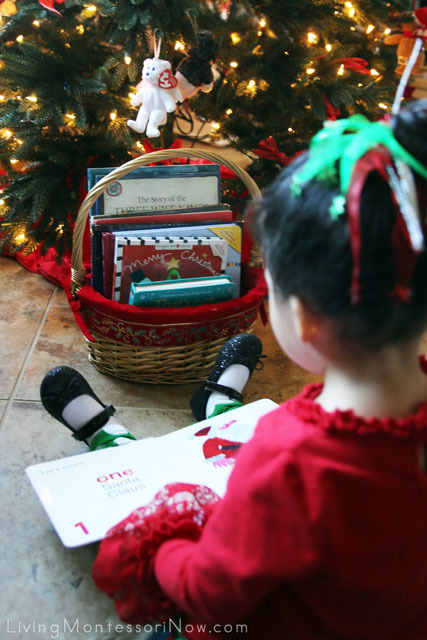 I LOVE Eric Carle books, and I’d gotten Eric Carle’s new book The Very Hungry Caterpillar’s Christmas 123 for Zoey’s Christmas book basket. Zoey had fun with this book as soon as she found it in the book basket on Thanksgiving Day. As I said, the 2 Christmas trees are perfect inspiration for making 2 Christmas tree ornaments … one for Mommy and one for Daddy. 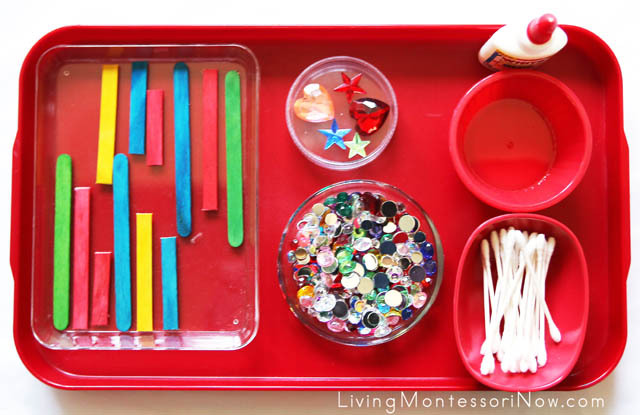 Montessori teachers and homeschoolers are familiar with the Montessori red rods as a sensorial introduction to length. Although this activity doesn’t have the quality and exactness of materials (or the isolation of quality), focusing on length is still a good way to introduce the first part of the craft. I laid out the green craft stick vertically and then had Zoey find the longest stick. We placed that at the bottom. Then she found the “longest stick left” of each craft stick (which I’d already pre-cut into graduated lengths). 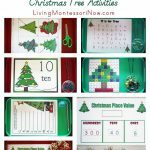 After she laid them out in a Christmas tree shape, she used a Q-Tip with school glue to glue each of the graduated sticks to the green stick. Once Zoey had the tree shape, she just needed to glue craft gems to her tree. 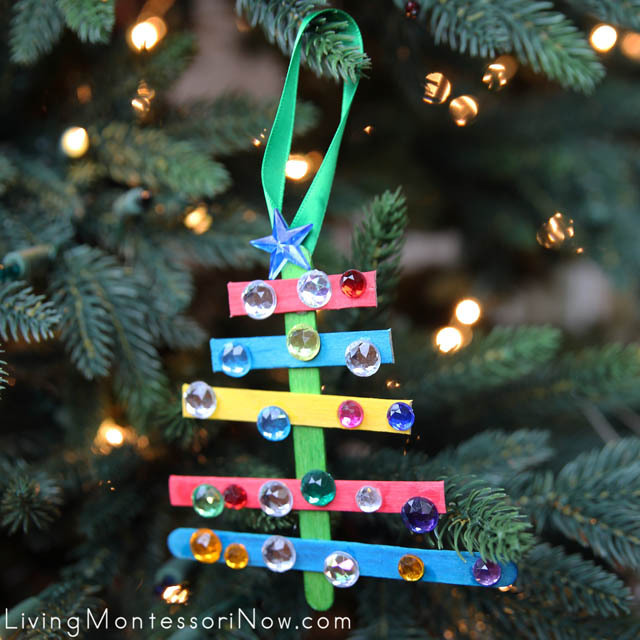 I had stars and hearts to choose from for the top of the tree and smaller gems to glue on the “branches.” It worked well to use the Q-Tip with the glue. I just changed Q-Tips a few times so they retained their shape for easy gluing. Zoey liked placing the dots of glue on the tree using the Q-Tips, which made that technique a good choice for her. With a 2 year old, this did require direction in creating the tree shape and gluing on the crystals. With preschool-age children, this would be a simpler activity. The activity still worked well for Zoey, although I saved the second tree for another day. 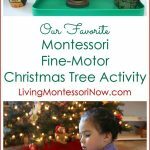 With a 2 year old, I wouldn’t do more than one tree at a time unless your toddler is especially interested in doing more. 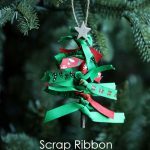 I glued on the ribbon (6 1/2″ ribbon for each ornament) using a hot-glue gun. I’m sure you could use a different type of glue, but I thought this would work well. 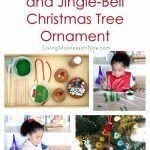 I’m a real fan of wooden Christmas tree ornaments, so I’m especially happy that I found this idea … and I love that even a 2 year old can make such a pretty ornament. I think the completed ornament makes a lovely present for moms, dads, and grandparents. I’m sure Zoey’s mommy and daddy will love theirs. 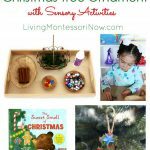 This post is part of the collaborative 10 Days of a Kid-Made Christmas, organized by Melissa Klinker from Mama Miss! 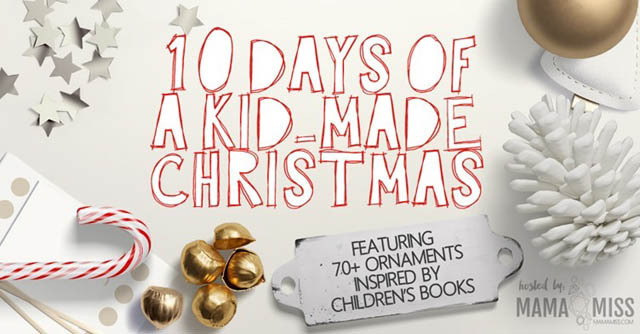 Be sure to check out the 70+ ornaments, which are all inspired by children’s books! 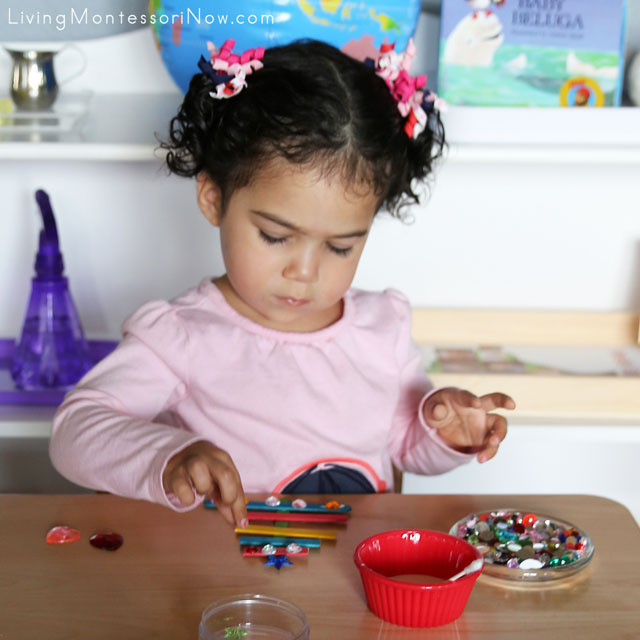 May be linked to Afterschool Express, Thoughtful Spot, Hip Homeschool Hop, The Mommy Club Resources and Solutions, Mom’s Library, A Little Bird Told Me Linky Party, Learn and Play, Preschool Corner, Sharing Saturday, Tot School Gathering Place. 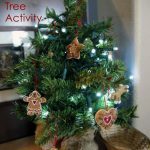 This tree activity is awesome! And I have everything on hand to help my little ones to do this already. Thanks for sharing! This is so clever. I have those supplies here, too, but I didn’t think of this. Kids will love making these. The book is a classic, too. Thank you. Pinned and shared. I bet she’ll be so proud to give this as a gift! Thanks for sharing at the Thoughtful Spot! 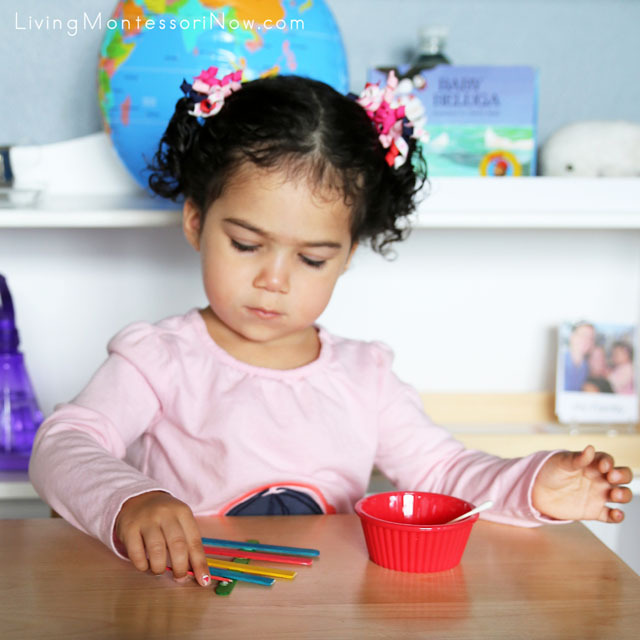 Adorable blog… his is such a fun creative craft.